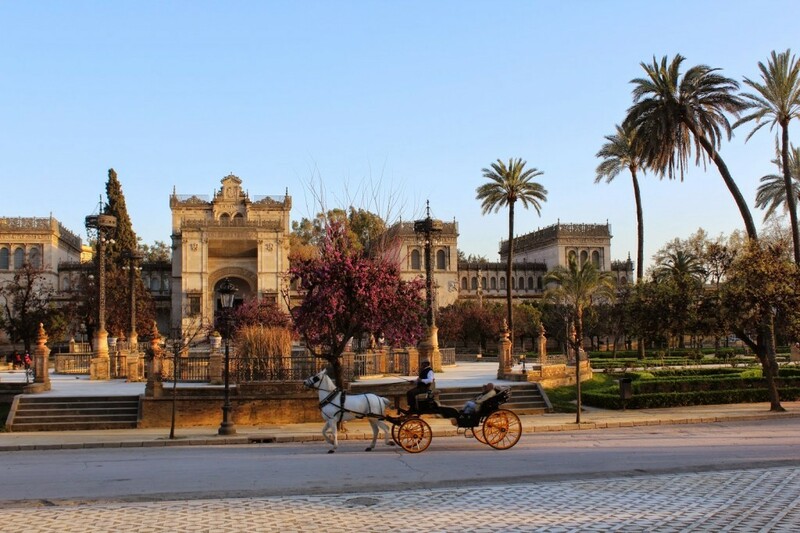 LoveLiveTravel recently spent a week exploring the Old Town of incredible Seville, Spain. As first time visitors to this historic city, we naturally wanted to visit its many must-sees: Plaza d’España, the Alcazar, the Seville Cathedral, and the Metropol Parasol, to name a few. Of course, they were all fantastic and highly recommended, but we also wanted to find as many ways as possible to get off the most heavily beaten path and absorb more of the local culture and lifestyle. 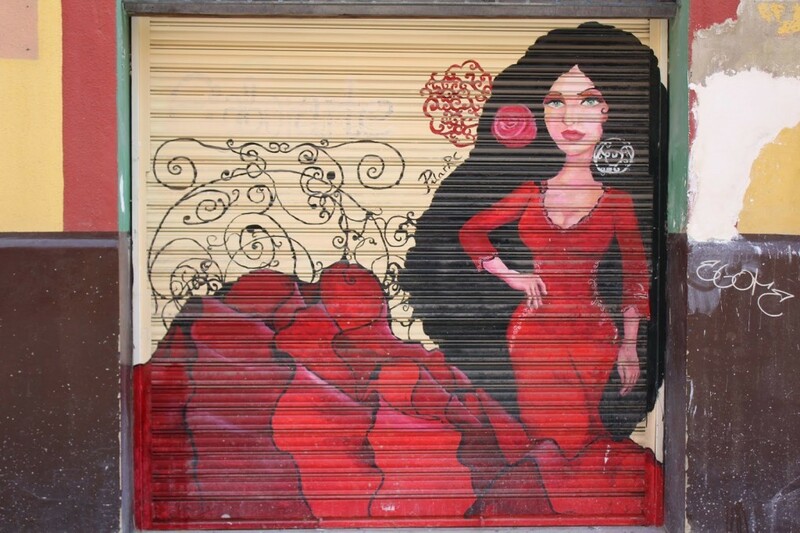 Here are ten ways we set out to discover the full Seville experience, and you can too! 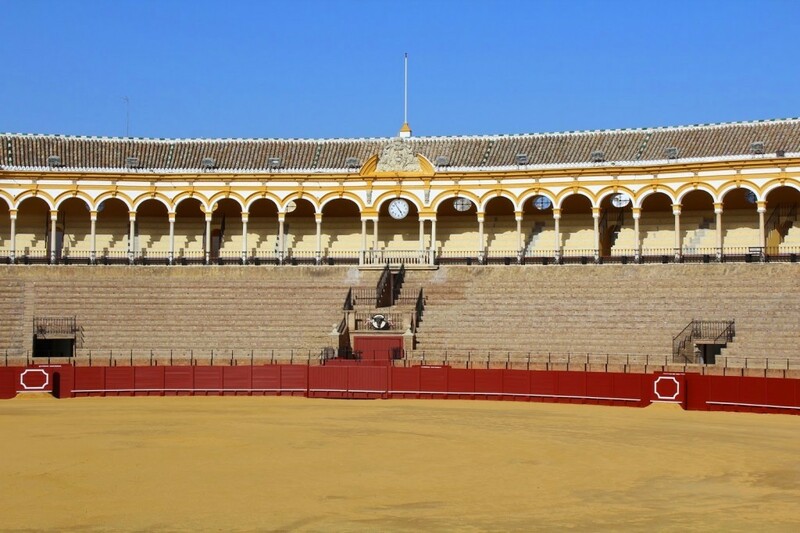 Though I would never attend a bull fight, our tour of Plaza de Toros de la Maestranza – Seville’s historic bull ring – was a highlight of our trip. 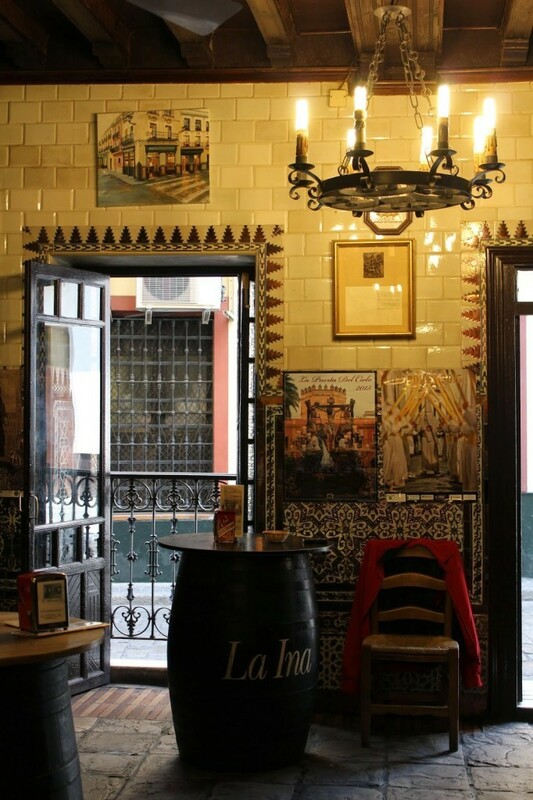 It is a fascinating place, beautifully designed, and an important part of Seville’s history. 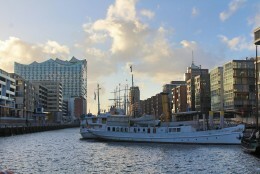 It’s accessible only by guided tours, which leave every half hour or so and cost 7€. 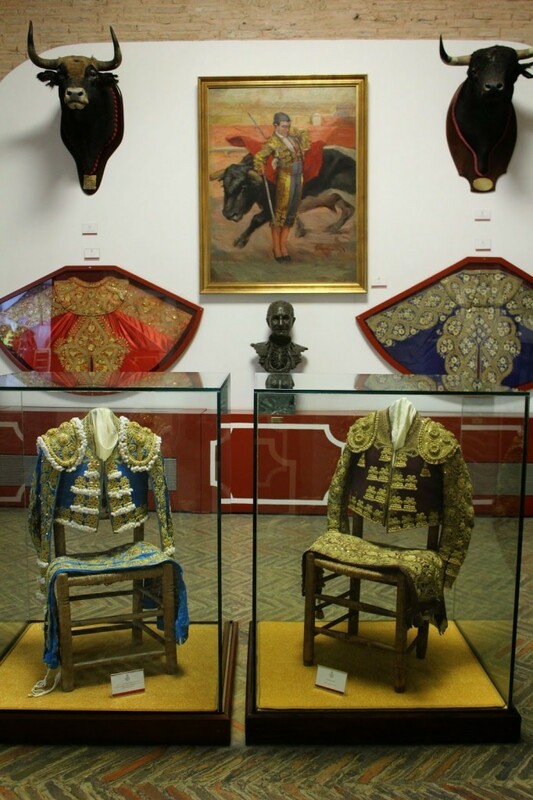 You see the ring itself and hear the history and stories of bull fighting there, then are guided through the museum’s exhibits. 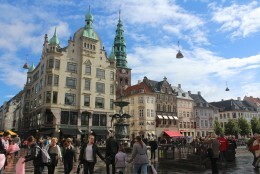 Tours are given simultaneously in English and Spanish by bilingual guides. 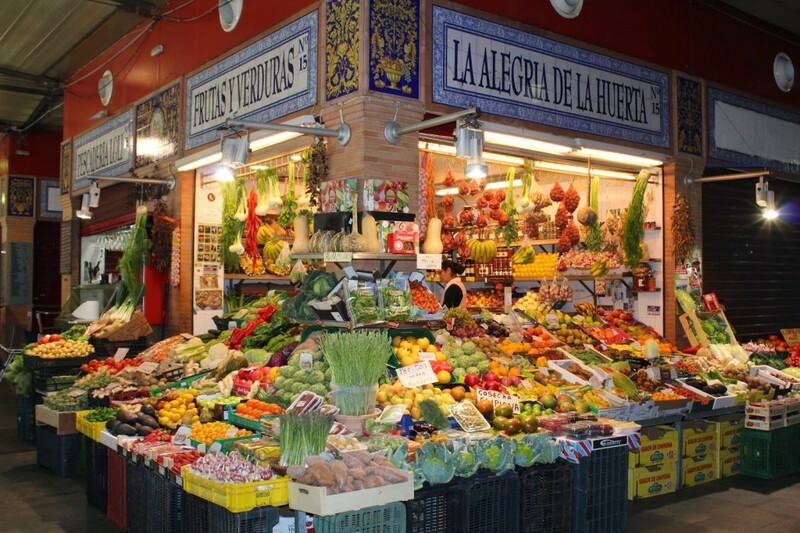 Every Thursday morning, Calle Feria is closed to traffic for La Mercado de los Jueves – the Thursday market. 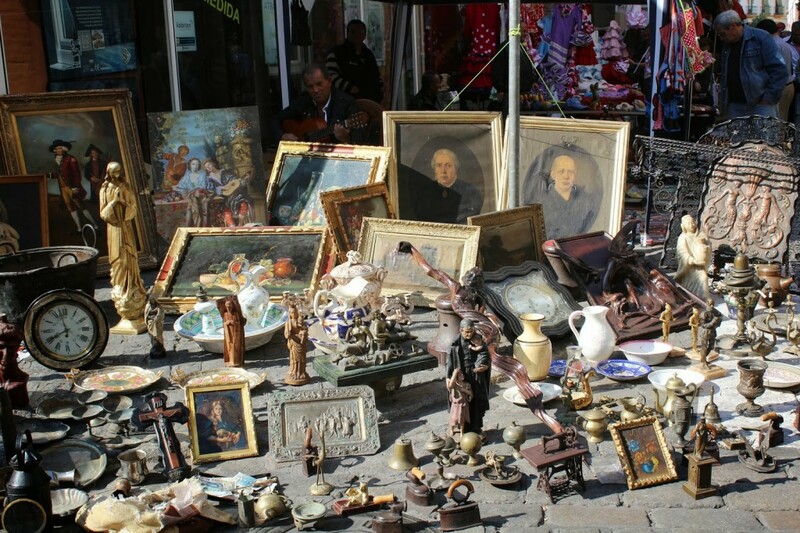 Local vendors set up their wares in the street, selling everything from antiques, art and collectibles to used clothing and toys. The market is full of locals, with few tourists to be found, and there is a great assortment of items to browse, even if you aren’t looking to buy. The market leads up to Mercado de la Feria food market, and the 13th Century Omnium Church. Seville is bursting with cathedrals, churches and chapels, the most famous being the massive Seville Cathedral, which is of course worth a visit. 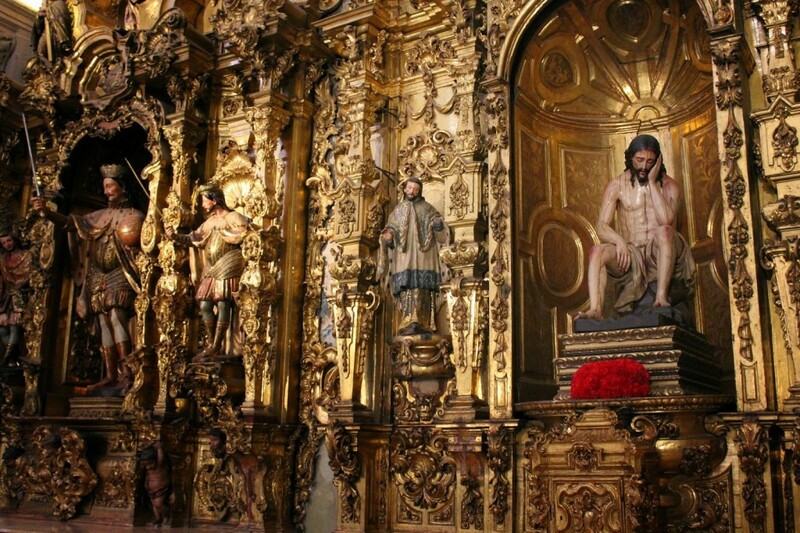 But our favourite church was the one you can visit for free with your Seville Cathedral ticket. El Salvador is a huge pink church dating from 1712 and set in bustling Plaza Salvador. Its interiors are absolutely stunning, and the coloured lights streaming through the windows and falling on the ornate religious icons make it all the more magical. We were lucky enough to have a mini fridge in our hotel room, so we took full advantage of it and headed to the local supermarket. Even there, you can find good quality Serrano ham, including entire legs hanging from the ceiling. 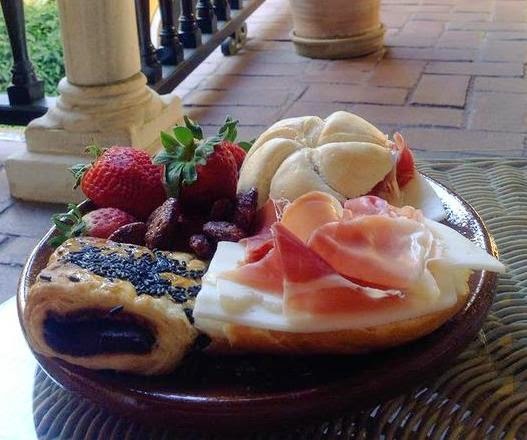 We bought ham, goats cheese, bread rolls, pastries, nuts, and strawberries and created our own gourmet breakfast to enjoy in the hotel courtyard. It’s also a great place to buy an inexpensive bottle of wine or liquor to enjoy in your room, and avoid paying a premium at the hotel bar. Whether you are a football fan or not, it’s a lot of fun to head to a match and support the local team. 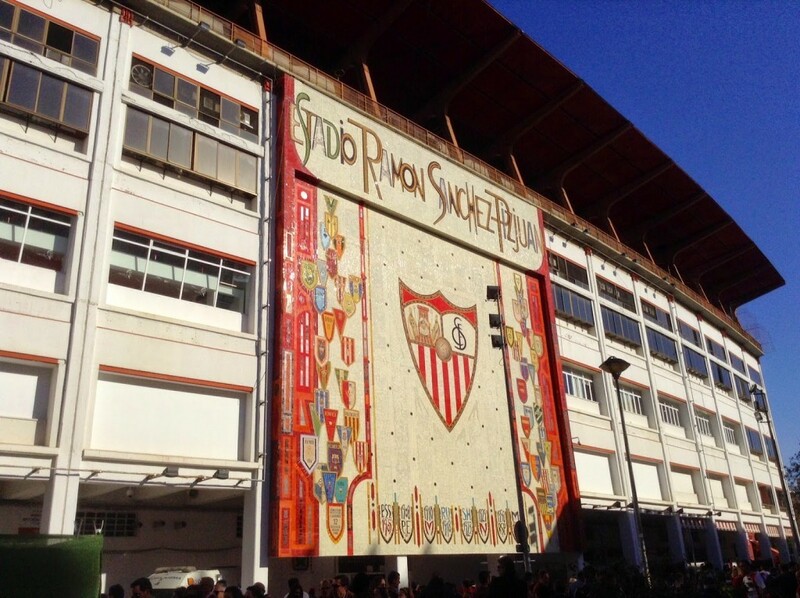 The Seville FC stadium dates from the 1950s and has a great historic feel. It’s a truly authentic experience to mingle with the local fans as they cheer on their team. 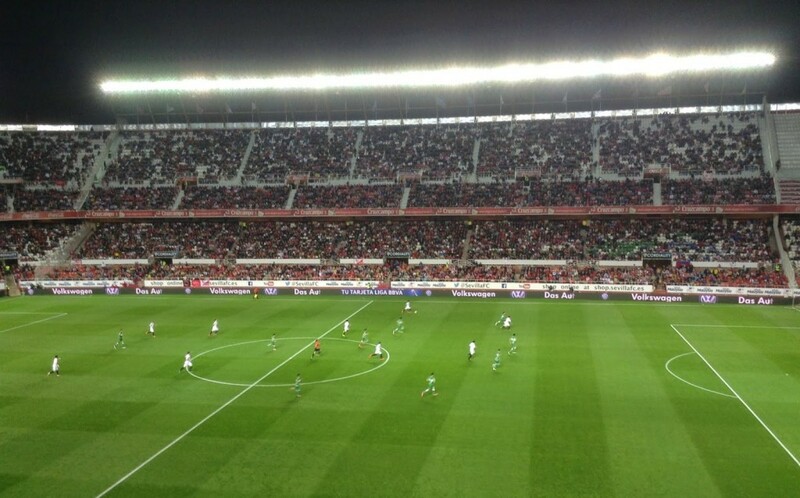 Though football isn’t really my thing, I had a great time watching the Seville team play a winning game, and it was a memorable experience. Tickets start around 20€ – try to get yours before game day, as they sell out quickly. 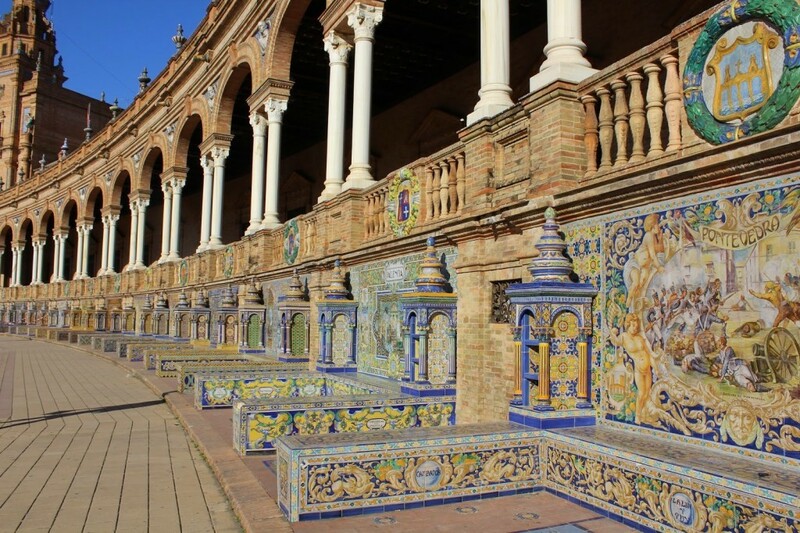 When in Seville, everyone heads to the Plaza d’España, and for good reason – it’s incredible. 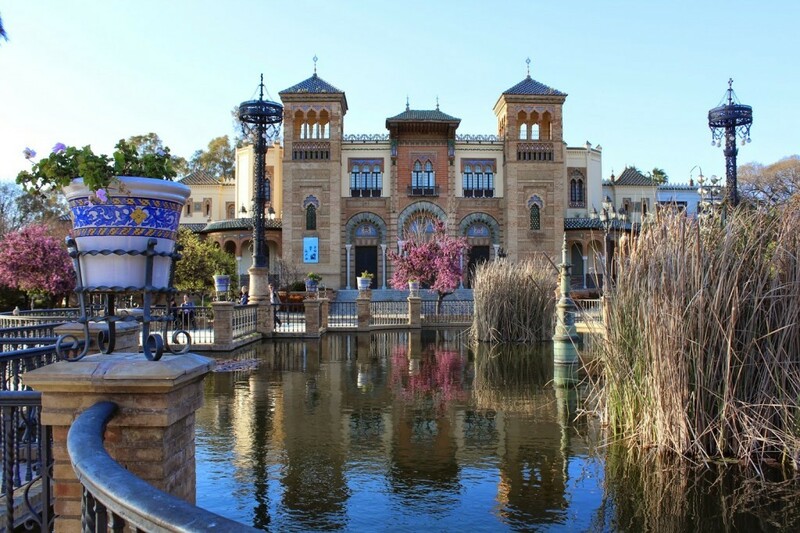 But when you visit, make sure to also explore the attached Parque Maria Luisa. A sprawling green space filled with ponds, fountains, and mosaics, it’s the perfect place to enjoy Seville’s sunny weather. Be sure to get all the way to the far end of the park to Plaza America, a tranquil oasis of beautiful museums and a pond. 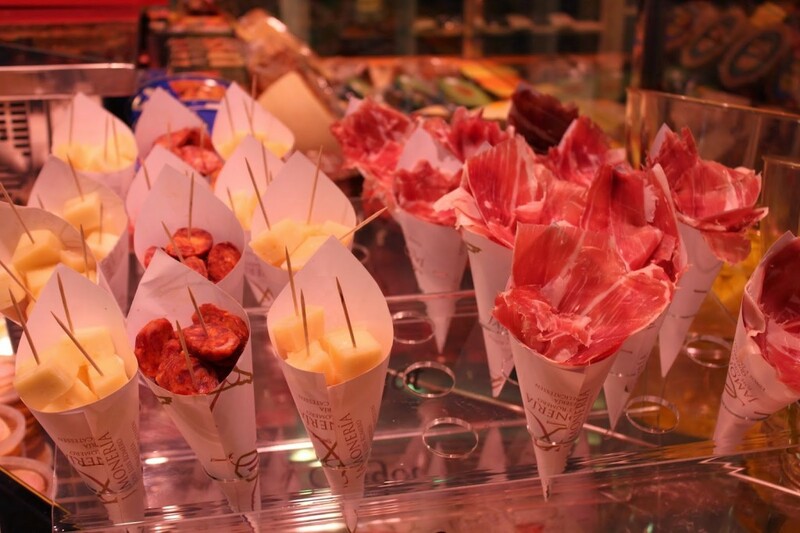 Of course being foodies, we wanted to hit as many markets as possible within our week in Seville. We made it to several, but Triana was the clear winner. Adding to the experience was the fact that it was across the bridge in the colourful Triana district. We strolled across the river munching on candied almonds we bought from a vendor along the way, and into the historic market. 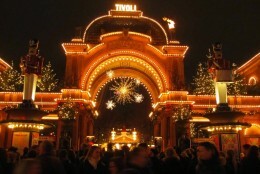 It was spacious and colourful, bursting with fresh produce, meat, seafood, cheeses, and sweets. If you’re feeling brave you can head to the ruins under the market, which have connections to the Spanish Inquisition. 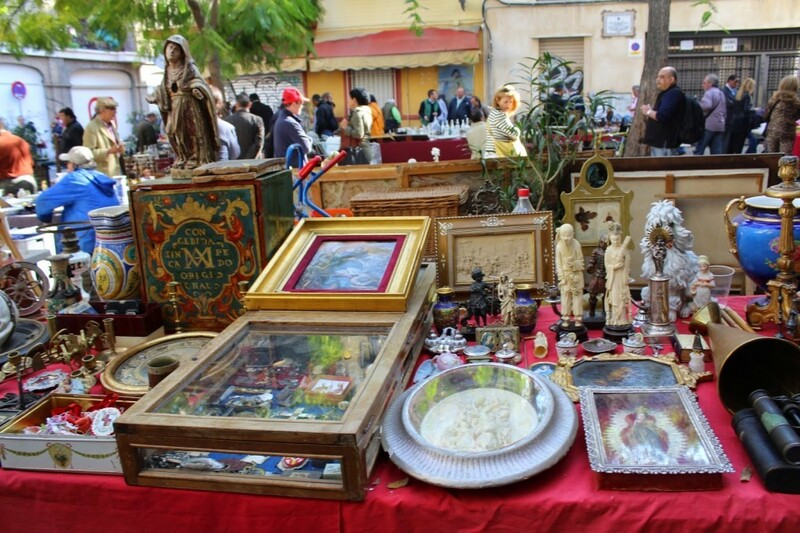 Tucked in behind the busy central shopping streets of Seville lies Calle Cuna. 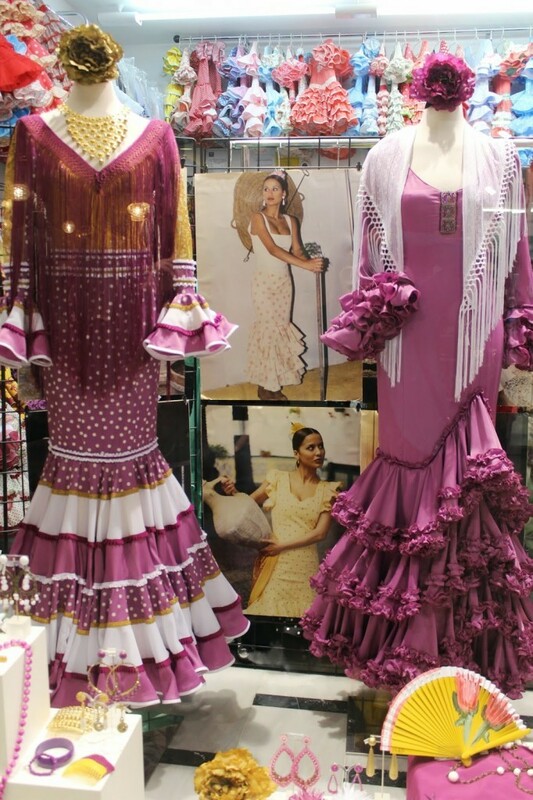 Here you can discover traditional clothing stores of every variety, from colourful flamenco dresses to adorably cute and dapper children’s clothing. 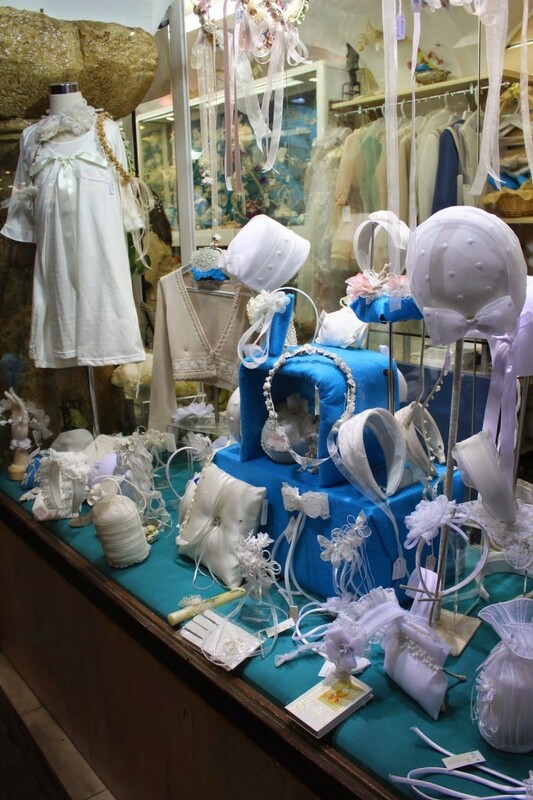 Christening and confirmation outfits are sold here as well, including little shoes and headpieces, along with religious accessories and icons, so it’s a great taste of traditional Spain. 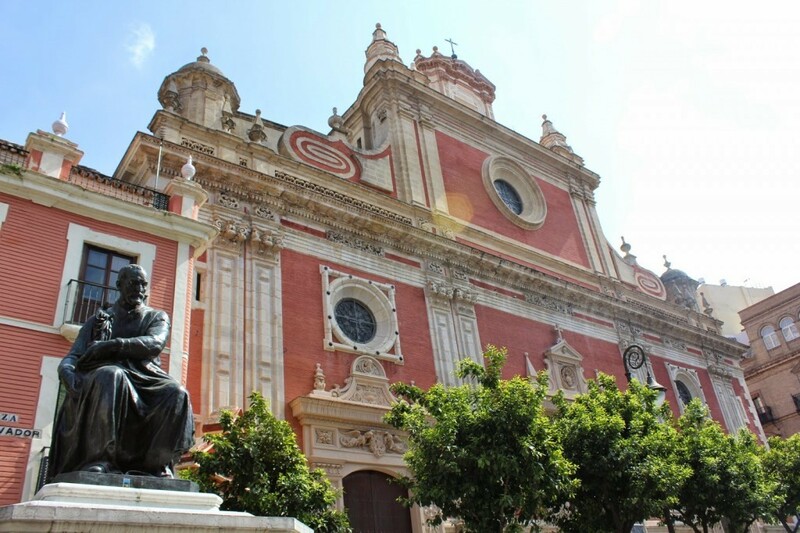 The must-see in the this charming northern area of the Old Town is the stunning Basilica de Nuestra Señora de la Esperanza Macarena, a truly gorgeous cathedral. 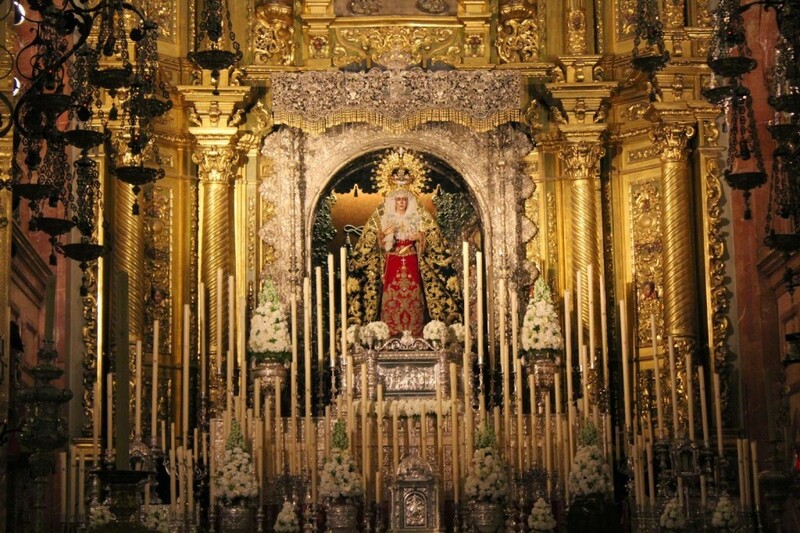 Its centrepiece is an ornate wooden image of The Virgin of Hope with holds court on the alter of the church. The neighbourhood itself is vibrant and full of character, featuring historic buildings, cafes, and street art, and is a great place for a wander. The corner shops in the this area are cheap even for Seville standards, so it’s also a great place to pick up some cold drinks for the road. 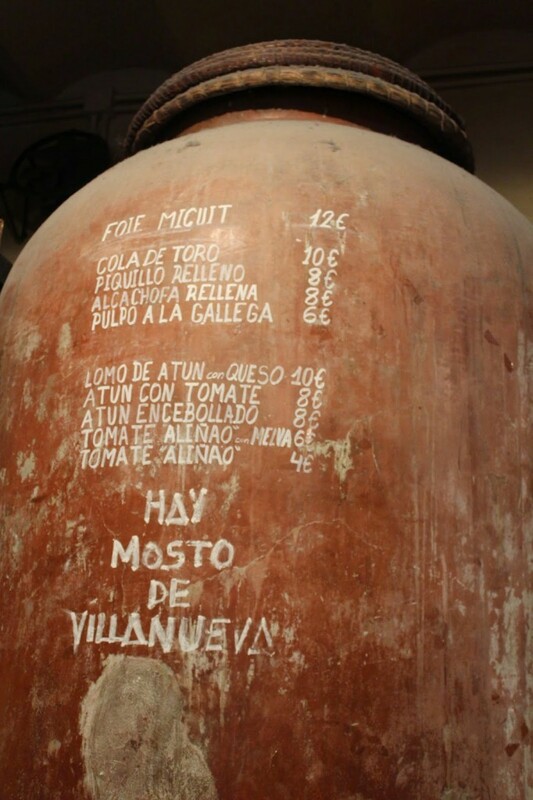 The rule of thumb when seeking out amazing tapas in Seville is this: if the menu is in English, keep walking. Since we ate tapas for pretty much every meal for a week, we ended up at a couple of tourist-geared places and the rule was definitely true. The most authentic places have menus in Español only, and even though you may end not knowing exactly what you’re ordering, they’re the best ones to try. Don’t just order what feels safe, be adventurous! 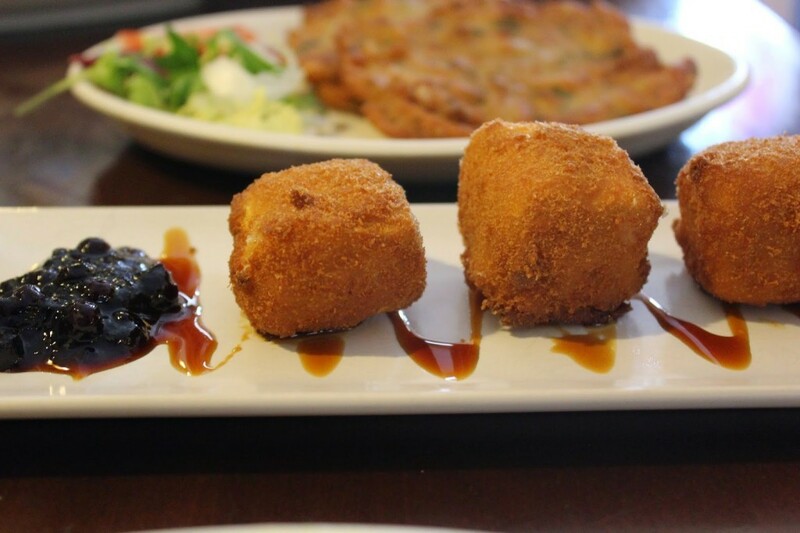 Tapas are small and cheap, so you’ve got nothing to lose. The very best meals we had, we just ordered and hoped for the best – and we weren’t disappointed. I fell in love with tapas I never knew existed, like grilled eggplant with balsamic and honeyed goat cheese.